Since 1950 estimated life expectancy at birth of the world’s population has been increasing. 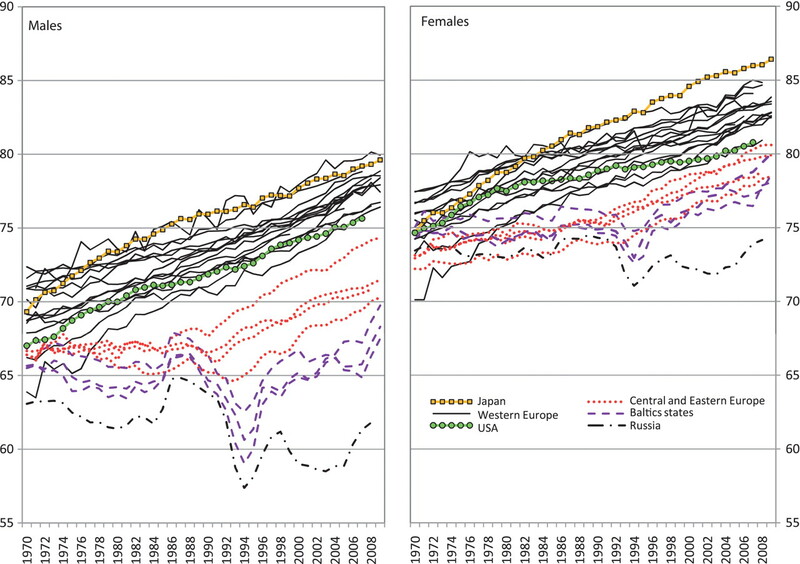 Initially, this was accompanied by a convergence in mortality experience across the globe—with gains in all regions. However, in the final 15 years of the 20th century, convergence was replaced with divergence, in part due to declines in life expectancy in sub-Saharan Africa. However, this global divergence was also the result of declining life expectancy in Europe. Home to 1 in 10 of the world’s population, and mainly comprised of industrialized, high-income countries, Europe has over 50 states. These include Sweden and Iceland that have consistently been ranked among the countries with the highest life expectancies in the world. But while for the past 60 years all Western European countries have shown increases in life expectancy, the countries of Central and Eastern Europe (CEE), Russia and other parts of the former Soviet Union have had a very different, and altogether more negative experience. Trends in life expectancy between 1970 and the latest year available are shown in the Figure 1 for an illustrative selection of countries. These data were taken from one of two open sources : (i) the WHO Health for All Database or (ii) the Human Mortality Database, depending on which one had the longest time series. Differences between the sources are minimal for the purposes of this editorial. It is important to emphasize at the outset, that with one exception (discussed below), the trends shown in the Figure 1 are overwhelmingly driven by changes in mortality in adult life, not in infancy or childhood and are not the result of artefact. Between 1970 and the end of the 1980s, life expectancy at birth in the former communist countries of CEE (Czech Republic, Hungary, Poland and Slovakia), Russia and the Baltic states (Estonia, Latvia and Lithuania) stagnated or declined (Figure 1). This led to an increasing gap between them and Western European countries as the latter steadily improved. However, within a few years of the collapse of the Berlin wall in 1989, life expectancy started to steadily increase in the countries of CEE. This vividly illustrates that mortality can decline rapidly in response to political, social and economic change. Interestingly, once underway, the post-1989 increase in life expectancy in these countries has continued at a steady rate that is very similar to Western Europe. These parallel trajectories mean that the East–West gap, measured in terms of absolute differences in years of life expectancy, is proving very difficult to eliminate, despite earnest hopes to the contrary. The trajectories of Russia and other Soviet countries, including the three Baltic States in the Figure 1, were strikingly different to those of the CEE countries. The anti-alcohol campaign introduced in 1985 by the last Soviet President, Mikhail Gorbachev, was accompanied by a brief increase in life expectancy. Soon afterwards there was a precipitate decline, induced by the collapse of the Soviet Union in 1991. This was particularly dramatic in Russia: between 1990 and 1994 male life expectancy fell by 6 years to a low of 57 years. There was then a short-lived period of recovery until 1998 at which point Russia once more declined. In the Baltic states, which by then were independent countries looking westwards for membership of the European Union, life expectancy improvements flattened out and for Lithuanian and Latvian men even reversed. In the most recent period, improvements have at last been seen in all the former Soviet countries of Europe, with the possible exception of Ukraine. But it will take a longer period of improvement to be convinced that Russia, Latvia and Lithuania have embarked upon a sustainable upward trajectory given their recent history. Notwithstanding the different consequences of the collapse of communism in the CEE countries, the post-Soviet experience shows that abrupt political, economic and social change can also have serious adverse effects on population health. The stress and chaos induced in Russia and other Soviet countries by the collapse of the Soviet Union and the transition from communism was very different to that in the CEE countries. It brought in its wake a dramatic and relatively long-lasting decline in life expectancy. This excerpt has been posted with permission from Oxford Journals. The full version of this article has been made available for free by the International Journal of Epidemiology. Click here to continue reading. David A. Leon is Professor of Epidemiology at the London School of Hygiene & Tropical Medicine. Posted on November 12, 2015 January 9, 2016 by ijeeditorialPosted in UncategorizedTagged demography, life expectancy, mortality.